Meet our ZERØGRAND Wingtip Oxford with Stitchlite™ a.k.a THE shoe of summer. Featuring an on-trend knit upper for maximum flexibility and breathability, this lightweight style offers a sock-like fit and eliminates the need to fuss with laces. From dressy looks requiring wingtips to jeans and sneakers attire, this wear-with-anything design covers all the bases. Amazing, comfortable, very stylish, worth it. The most comfortable shoe I have ever owned. I’m on my feet all day for 13+ hours and these shoes felt great from the first day. I did have to get a half size smaller than I normally wear as they do run big. I have three pairs of these shoes in different colors. They are the most comfortable shoes I have ever owned. They still look brand new after several months and after walking all around London and Paris. Not only do they feel great but they are surprising durable. My three college age sons loved mine so much they wanted their own. Great shoes! The most comfortable shoe I have ever owned!!! You will not go wrong if you purchase a pair of these wonderful shoes. I have a very hard to fit foot but these shoes fit like a glove. Shoe is very comfortable. It’s lighweight, fits well and doesn’t move around on your feet, and doesn’t slip on a wet sidewalk. I normally wear a size 11 and had to drop a half size in these. In going to a 10 1/2 you don’t loose any of the width and the length is spot on. Also, doesn’t make the ties across the top of the foot look like your shoe is undersized. The fabric around the ankle has a bit of stretch to it which adds to the comfort as there’s no pinching or cutting into the ankle. Overall very pleased with workmanship and construction. Will definitely buy again and recommend to others. This shoes is amazing. Feet don’t get tired or sweat. Wearing 11, but this shoes feels like 11 and 1/3 And became just a little bit bigger after wearing 4 month, because of textile. These shoes are awesome, love the look and feel. Really comfortable. I love these shoes, they fit like a sock. You can just slip them on. Love the fact that they are narrow and snug. They haven't lost any stretch so far. They are very breathable and comfortable. They however run small so take it in account. I would recommend the product. Was nervous about the look but it is still professional and I received a lot of compliments at work. I was a bit skeptical about the look - blending a sneaker sole with a slightly funky knit wingtip - but I'm a fan. The shoes really work for me as a very comfortable commuting shoe in hot weather. They breath and ventilate my feet really well. Great shoe and also great fit. This shoe is a must for all guys. You can rock it during all seasons with any type of outfit because it's so versatile and it fits great! I had to buy it in white and black! Very light and comfortable shoe. Purchased them as a summertime shoe wore them in South Beach and they caught lots of compliments and went well with everything I wore. Stylish, light, well crafted and contemporary . One problem: they will cause blisters if you don't wear the peakaboo socks to diffuse the friction between your foot and the inner shoe lining. Super comfortable and light. Great for summer and warm weather. Good looking light weight shoe but the soles are not very comfortable to be in all day. Waiting for the summer months to enjoy the comfort of this great soon. Very light and comfortable. 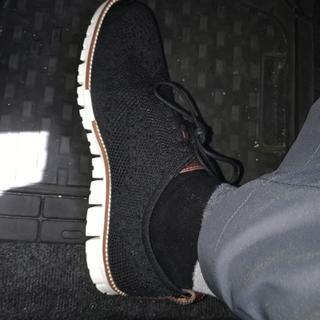 I've already recommended this product to friends who are looking for a casual dress shoe that feels like a sneaker. My favorite part is that I am able to put my shoe on and take it off without undoing the laces. A friend told me about how wonderful they are for people on their feet. My husband sells cars so he spends a lot of time walking and being on his feet. Great casual style for a night out on the town or at the office. IT'S A GREAT LOOKING SHOES! IT LOOKS AWESOME TO "A COOL" BABY BOOMER. Have friends who own these shoes and they love them so I figured I would give them a try. It is the closest to what I was looking for! Thank you! My husband already has a pair in grey and loves them! My husband already have one of this and he loves it. It's very light and comfortable for him who walk or stand all the time. tried because favorite shoe was out of stock. husband loves these too! Beautiful shoes that can be used for all situations, most importantly work. It's a great looking shoe! Extremely comfortable. You can dress it down or dress it up! I already own 2 paid (Blue & Gray). I love these shoes. Very comfortable. I have a pair now and I love the comfort and feel when wearing this shoe. Its stylish and contempary. The shape and color of the shoe and my previous experiences of Cole Haan. Love to wear these without socks and they are still very comfortable. Wanted another pair of Zerogrand's, but another option besides leather. Because they're gorgeous and I've been waiting on a sale like this! These look really smooth and have a dressy/ casual look that can be worn with a suit or with jeans. I work in car sales in Kansas. Summers are hot. I want a professional looking shoe that is light weight and cool. Minimalist style, comfortable shoe wear for business attire. My husband has a blue pair and LOVES them. They are a slip on and very light weight with great support! We highly recommend them. 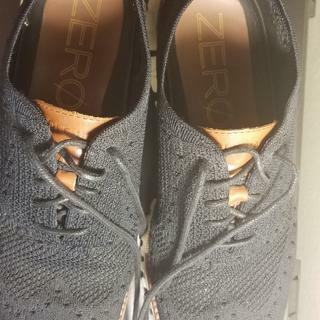 Are the ZERØGRAND Stitchlite Wingtip Oxford true to size? Or do they run big or small? BEST ANSWER: They run very big, order smaller size to get the snug feel of the Stitchlite. 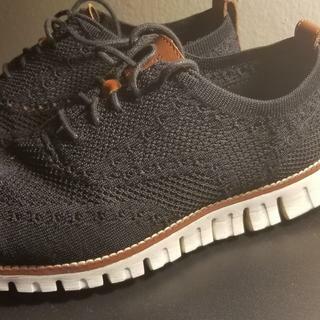 Are these more of a summer shoe and would they be cold and susceptible to getting wet in winter more than the suede zerogrande or same as these? BEST ANSWER: The ZeroGrand Stitchlite is a new style for Spring '17. The upper is made from a lightweight and breathable fabric, making it perfect for warm weather wear. The suede ZeroGrands are sharp, but should never be worn in wet weather. When will a darker sole version be released ? The white isnt working for me. Pls don't say see the link for stitchlite- thx. BEST ANSWER: All Stitchlites will have white soles. Can you get this with a black sole? Are these stretchy enough to slip on and off with your retying the laces? BEST ANSWER: Yes. I do it all the time. I don't think I have retied them once in weeks. On a separate note, initially they were slightly snug. A few wearings and they loosened up. Very happy. Probably get another pair in a different color. Yeah, I highly recommend the shoe. I got them in two different colors. Super comfy (I took the insole out and put my orthotics because of my flat foot but they still fit great). Nope! They are knit but just don't seem to have the same spandex that Nike flyknit shoes have. YES ! I don't remember the last time I tied the laces ! No, not unless the laces are very loose. How do you clean the body of the shoe? What is the best way to clean? the upper part of the shoe? BEST ANSWER: My suggestion to you is to purchase Cole Haan cleaning products. I have the Grand Sole cleaner for my Stitchlite. I hope this is helpful. Dove soap and warm water on a washcloth. I have had these shoes for a few months, and they are already starting to stretch out. Is there any way to prevent or reverse this? Washing them, maybe? BEST ANSWER: This style was not manufactured in Wide width. Currently, the only footwear with Stitchlite in wide width is the GrandMotion Woven sneaker. To find currently available similar styles, you can use the filter drop-down tabs on the side of the shoe page to shop by size, width, color and more. Do this shoe (c24948)come In W(wide)? BEST ANSWER: This particular ZeroGrand oxford was made in Medium widths only. To find currently available wide width styles, you can use the drop-down filter tabs on the side of the shoe page to shop by size, width, color and more. Do this shoe come ib size 15? BEST ANSWER: So sorry - up to 13 only. For information on our styles that are available in size 15, use the drop down tabs on the men's shoe page. Why is this shoe not available in a men's size 14? Increasingly, I'm having diffulty finding Cole Haan footwear in size 14 and it's becoming more frustrating. BEST ANSWER: While many of our men's shoes are available in extended sizes, we manufacture most styles in the more common sizes of 7-13. Will this be available in EEE width? BEST ANSWER: Stitchlite is only available in medium widths.